When a friend from Bangladesh gifted me a jute bag with the Bangladesh flag motif painted on it, I asked her to explain the symbolism. She told me it stood for the rising sun over the green fields, reddened with the blood of liberation martyrs. Resultantly, in Bangladesh, these atrocities have become over the years part of the collective memory and the national narrative. The hurt and anger has festered to the beat of nationalistic fervour and has turned into an unrelenting, bitter hate and hardened prejudice against the enemy. On the backdrop of this charged nationalistic sentiment, in 2010 the International Crimes Tribunal was established by this government, though its legitimacy and capacity to deliver justice have been put to question by objective observers. There is also the concern that the much-awaited decision announced recently was more a political than judicial decision. The Jamat e Islami is an important part of the political opposition against the current regime. The primary accused belong to the Jamat, widely considered to be complicit in Pakistan army’s violence against the Bengalis in 1971. While the demand for justice to war criminals is understandable and legitimate, the concern is about whether this public sentiment has been used for political opportunism. Given the traumatic birth of Bangladesh and the horrific memories haunting public imagination, a regime credited with bringing offenders to book will win hearts. Given the many failures and weaknesses of this regime as well as the fact that the Jamaat is a vital member of the opposition alliance, there seems to be a method to the madness. The social consequences have been grave with violence spiralling out of control. The long-term repercussions are graver still. Opposition to the verdict has been brutally crushed by the state machinery and violent reprisals have victimized hundreds. The crowds calling for a death sentence are led by secular-liberal segments of the society and have massive support from members of the civil society. The opposition to the death sentence comes from the Islamists led by the Jamat e Islami which has sizable following. The scars this will leave will drive a wedge between these two segments along ideological lines. It will accentuate and intensify a dangerous polarization which in the long run shall be in the interests of none. With the two opposed camps locked in confrontation against each other, a state eager to use force and one or both groups- having deep roots into the society- often violently lashing out against the other, the future looks grim. A gaping split across the social spectrum with a spattering of violence is the perfect recipe for disaster- the same disaster that Pakistan is mired up in. This dampens down the hopes for a stable, peaceful, progressive Bangladesh. In this wider context, it becomes apparent that it is not vengeance but clemency that Bangladesh needs. Violence begets violence and sets off a vicious cycle. That vicious cycle needs to be broken. Forgetting bitter memories is hard, but sometimes, a bit of voluntary historical amnesia makes the future clearer and brighter for us. Justice and peace are great ends to be striven for. But the tribunal and its decision is at best a pretense and at worst a grave travesty of justice. 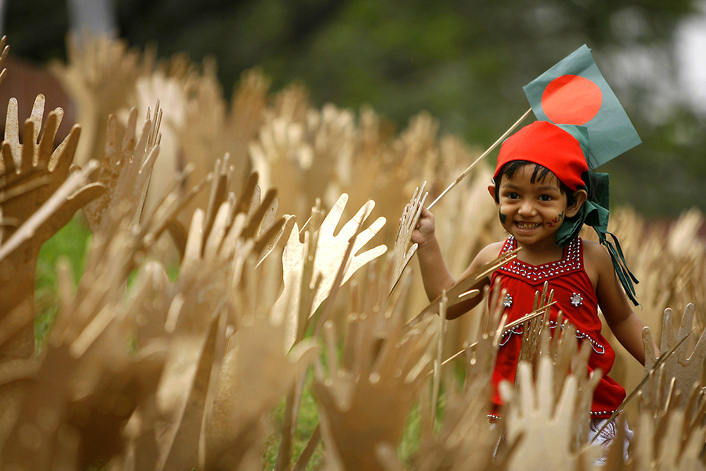 Bangladesh is a rapidly progressing country and has risen out of the blood and fire it was born in- I hope its great people would prefer to look ahead, refusing to let their sentiment be used for political purpose. For, when you look towards the sun- which, as my friend explained- is the proud national symbol of a country that deserves to rise out of a bloody past- you let the shadows fall behind you.